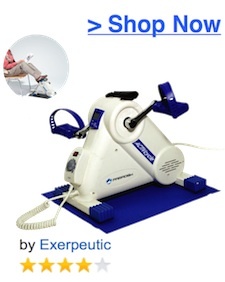 Under Desk Pedal Machines – Pedal Exercisers. 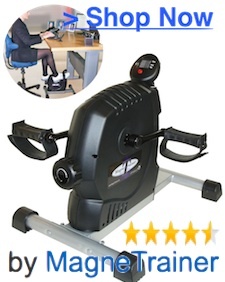 The office exercise equipment market has brought several choices for compact mini pedal machines that will fit under your desk at work. This page is about several different styles that would be suitable for that purpose. As well – some of these can be converted for use as arm bikes too. 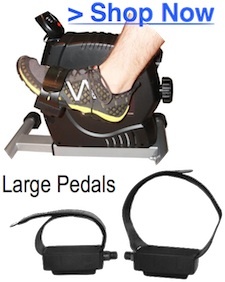 There are other types of pedal machines that are a little bigger or have multiple functions that you can also consider and they can be found on these pages for recumbent bicycle desks and bicycle chairs. The first in the series is the most popular. Easy to assemble, lightweight and stores out of the way when you aren’t using it. The people who use these properly have raved. They are happy with how quiet it is and how it works well to keep your legs moving while seated at your desk or even watching TV. They come with adjustable tension knobs to make your workout more or less challenging. The usual complaints about pedal exercisers are how light it is and will slip across the floor when you are trying to use it. Well, yes – its a lightweight, portable, mini cycle. To combat this – if you are going to be going at it on a more horizontal plane you may need to prop it against a wall. For the most part, if it is on a rug or a rubber mat – you should be OK.
1. 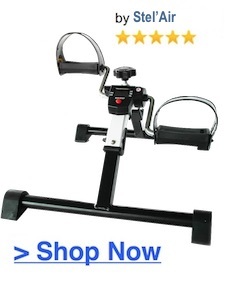 The Stel’Air Deluxe Folding Pedal Exerciser – it is the least expensive but still has sold hundreds with a 5/5 star rating. Save 10% on your order when you enter the coupon code: DELUXE at checkout! Coupon Code: DELUXE at checkout! 2. 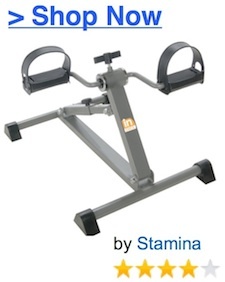 Stamina InStride 15-0125 Cycle – This one has the added feature of being able to change the height to suit different angles and height of the pedals for comfort and use. 3. Stamina 15-0120 InStride Cycle XL – This one has an electronic monitor so you can time your workouts if you like to keep track of the calories you burn while at work. The second set of mini pedal bikes to compare are a little beefier and provide greater resistance and more calorie burning and cardio abilities. For the extra $50 the return seems to be that lots of people are raving over the calories they are burning and even experiencing weight loss. Well made and these are, quality design, and quiet. The common complaints are slides across the floor or its a little wobbly. One person did complain they had some issues with the ability to effectively use it. Even though it comes with secure straps to strap your wheeled chair to it so you don’t roll apart but there was one person who said their office chair was still too light for them to be able to really get a full workout. Fold for easy portability & convenient storage. Desk & Cycle all in one. Folds for easy storage. Low profile and fits under most desks. – – –>> Go here for a more info on the DeskCycle. 2. Still on top, the MagneTrainer-ER Mini Exercise Bike is next. This under the desk pedal machine is taller than the DeskCycle. Considered to be commercial made but still lightweight. It also has an electronic monitor that will display the speed, time, and calories. 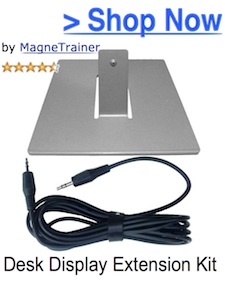 There are additional accessories for purchase (see below) that will allow for use on your desktop to exercise arms and there are also larger pedals available if you need them. 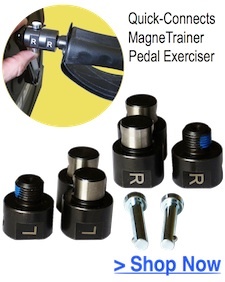 – – –>> Go here for a more in-depth information on the MagneTrainer. 3. 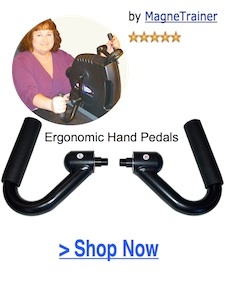 Still at the top sellers list and holding at a 3.5/5 stars is the Isokinetics Deluxe Pedal Exerciser. This is half the price and comes fully assembled. Fits under the desk nicely. It also comes with anti-slip strips for use on smooth floors. 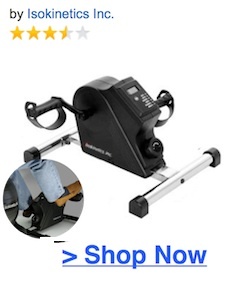 The third category is the motorized pedal exerciser. Common attributes are – Adjustable speed, overload protection, display monitor for RPM, distance and time. Because it is motorized it is more commonly used for therapeutic reasons although can be combined for calorie burning and toning purposes. 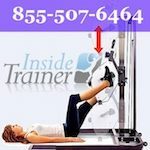 Medical ailments that have reportedly benefited from using a motorized pedal machine are people who endure swelling in their lower legs, persons with Multiple sclerosis (MS), Parkinson’s disease (PD), sustained leg, knee, or foot injuries, have circulation problems, or other mobility challenges. Users seem to be of two camps. The ones who are pleased are VERY pleased, and the ones who are not – are disappointed. Generally speaking, the people who were happy had made their purchase for therapeutic reasons. The people unhappy had expected a workout machine for heavier physical exercise. There are only two in this “Motorized” top sellers list, others have not made over a 3/5 star rating. 1. 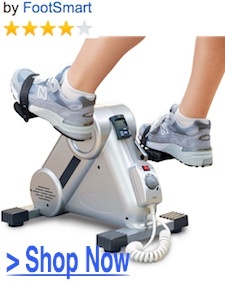 The Exerpeutic Motorized Mini ACTIVCycle has a solid 4/5 star rating. Although some websites do say you can use this with or without the motor assist – the manufacturer says not to. Top compliments from the all people who have purchased this for medical and therapeutic reasons. 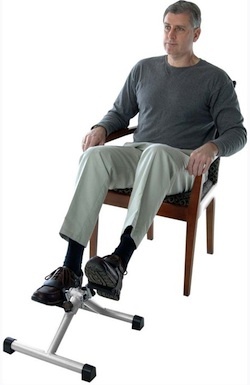 Negative feedback from the happy customers have to do with the standard foot pedals may be too small for larger feet, and obese persons may find the device too narrow. As well – the motor will only work for 15min at a time. 2. Electronic Pedaler is also has a good 4/5 star. 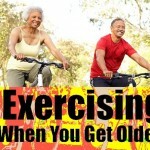 Several people for diverse medical reasons have been using motorized cycles for a long time. Some are on their fourth and fifth machines because they prefer the portable and mini aspect of these style of pedals. These are people who have given the machine 5 stars – This is a good way to secure reasonable expectation when ordering a $160 medical device. People are very happy with the performance, the included rubber non-slip pad, and the measurable benefits they are getting from it. Negative feedback is the electric control isn’t long enough. This would be great when I don’t have time for the gym and need to burn off that extra slice of pizza from the night before. I have started using a cheap mini cycle, similar to the first one in your review. I can’t use it under my desk – my knees hit the top of the desk, or I have to move back, thus making work impossible. I was going to throw it away until I tried it in front of my sofa while watching tv, and that’s where it works well. I’m getting some exercise in during a situation where I’d normally be completely sedentary, so that’s a bonus. When it wears out I’ll most likely buy a DeskCycle and see if I can actually cycle under my desk this time. 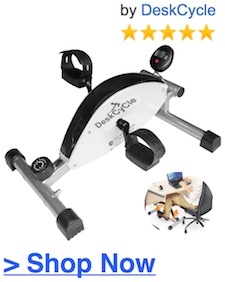 Yes the DeskCycle should fit nicely under the desk for you without any issues. 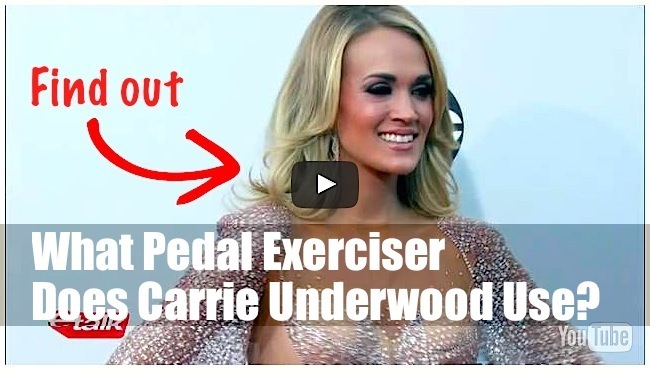 I do have a few solutions to common issues with the pedal exercisers offered on this page. I hope all is well with you 🙂 ! Sandy, I really wanted to tell you how much I LOVE my little desk cycle!!!!! It took me under 10 minutes to assemble it (and I am not a handy person at all!) and it fits perfectly under my desk. I have a desk with an adjustable keyboard that I could move up and down, so there is plenty of space for my legs to move. I’ve been using my desk cycle since I got it on Wednesday and I can’t stop peddling! LOL. I love that little guy soooooooo much! I find that putting it on 3 gives me the right intensity to peddle throughout the day without getting sweaty. My goal was to have something that would allow me to move while working as I’m bound to my desk all day, and this little guy does the trick! My evening workout sessions just aren’t enough to compensate for being planted in the same spot all day like a tree. 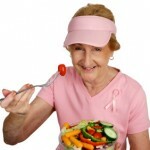 Another great thing is that… I don’t feel tired/ sluggish anymore!!! I would feel totally drained and unenergetic early in the afternoon… I’d feel so unmotivated to go to the gym because I felt like I had no energy. Now, when 4 o’clock arrives I’m ready to hit the gym and have a solid workout! I also wanted to take the opportunity to thank you for your time and amazing customer service skills. You are one great lady with a heck of a good sense of humor and a way to make people feel good about themselves. Thank you for being so awesome! It was my pleasure. You were an awesome customer. It really does make a difference in your energy level too when you can move more during the day. How does the DeskCycle compare to Lifespan’s desk bike? The latter is a lot more expensive, but perhaps better for posture? Hi Kate, It really isn’t a direct comparison as the Lifespan bike is one unit and less versatile. With the DeskCycle you can use your own favourite chair. work with my wheel chair? It has a fixed foot rest on the front. It’s really hard to say without seeing your setup. I would say the best person to ask would be your physiotherapist. 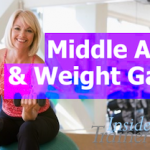 They would be practiced in making adjustments so you can get the leg movements you need.